Greetings – after what we hope has been an enjoyable and restful festive period! BUT FIRST – just a brief piece of information about the website itself where a couple of small changes have been made to the ‘layout’ – these with the intention of more accurately reflecting the way in which the ‘Newsletters’ and ‘Website Additions’ have been added and located on the website. Although the couple of former members that we recently tried to contact through Facebook did not result in any positive response, the ‘inevitably slow’ search continues – and, fortunately, a couple more ‘possibles’ have just cropped up after responded to a recent item about the DC on the Facebook/Walthamstow Memories link! Two of these have actually mentioned that they were involved in the Drama Club – so hopefully the attempts to make contact will be more successful this time around – especially as one mentioned being in one of the plays from the 1957 Essex Drama Festival! However – no prizes unless, of course, you can also track him down in person! If you need a clue – he is in the back row! A couple of further trips to the British Library since the publication of the last Newsletter have again proven to be fairly productive and produced quite a ‘mixed bag’ – with the reports on several plays being complemented with some particularly interesting and ‘historical’ ‘finds’ – such as one about the Drama Club receiving a bit of ‘national’ recognition with the award of the Constance Power Trophy in 1969. The record of this award has actually has been shown in the ‘Productions’ time line for some while, but now has more detail from the actual 1969 Guardian’s Report. The other ‘historical’ find is of yet another, and perhaps the first, Essex Drama Festival entry; this time in 1957 with 2 previously unknown plays – The Fish’ and ‘Grand Partiality’ – now to be added to the our ‘repertoire! A further short, but noteworthy find, is from the 1967 Editions that reports on the creation of our ‘Teenage Theatre’ and the organisation of a ‘Supporters group’ – which both bring back some interesting memories. The most recent search also revealed some additional reports on the 1968 production of ‘The Town that had a Pagean’ and ‘Aladdin’ in 1969; also some ‘preview’ material about a forthcoming production of ‘Pearly Pearls’ and how one of the long established members would be ‘progressing’ from ‘on stage’ to ‘off stage’ – e.g. temporarily nudging Cyril out of the producer’s chair! Scanning copies from the Guardian volumes (try to imagine the bulk of 26 copies bound together!) can be something of an ordeal when a fully opened volume doesn’t lie flat at the fold, or the text covers a large part of the page – as was fairly evident in the previously inserted item of the 1960 School Prize Giving! This report has now been re-scanned and hopefully the replacement in the website will be somewhat more legible – but still complemented by typed version – just in case! However, if anyone is desperate to see their actual prize-giving results (which are not included in the typed version), then leave a note of the Website Contact page and the original will be put under a microscope for you – at no charge! Thanks to some promised attic searching by Dorothy (Austin) over the festive period, a couple interesting school photographs have now been added to the Markhouse Gallery; one of her hard at study and the other with her class and their form teacher John Jones. Dorothy also came up with a much clearer version of one of the existing photographs in the ‘1066’ Gallery and this has also be added. Finally, the earlier Newsletter article about Mick Everett has been updated with some information and comments from Margaret and their son Howard – along with their thoughts about how good it has been to have read the reports from the Guardian about Mick’s exploits in the early days of the Drama Club. 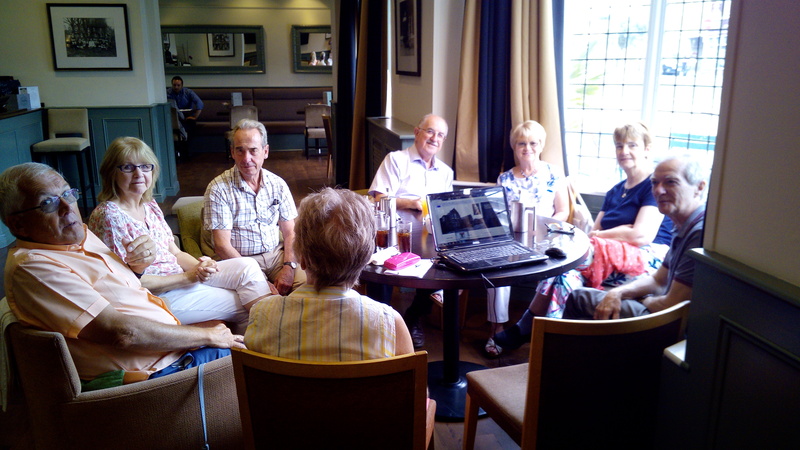 The previous Newsletter mentioned the ‘Mini Re-Union’ that took place after the Website Group’s meeting last July – which proved to be a really enjoyable opportunity despite a couple of last minute hiccups stopping a few from attending. It also proved a good strategy for making sure the ‘business’ part of the agenda was sped through – so much so that the same invite is being extended to the forthcoming meeting on Wednesday 3rd April. Just let Dave M know if you are likely to come and he will confirm the final details nearer the time; including any venue change – but it will still in the Chelmsford area – with a guaranteed lift from the Station if required! After the recent appeal for more leads from former members, it is good to report that there is now at least one further Performing Arts Project for Young People on the horizon – which we hope start developing within the next few weeks. However, there is still sufficient scope for at least one more project – so we are still looking for a former member to provide a link to someone, either in their family, or in a group with whom they are involved, to enable us to put the rest of this funding to such good use. So – if you have any thoughts, however tentative, then please get in touch with Dave on 0208.657.6327 – or at dm2013cmmf@googlemail.com for further info and/or a chat – with no strings, or ‘work’ attached!!! ENCORE! – WE SHOULD HAVE WRITTEN THIS INTO A PANTO! The final part of this ‘mixed bag’ of a Newsletter comes from the most recent search of the Walthamstow Guardian Archives – wherein the results of which earned a few disapproving glances in the obligatory hushed atmosphere of the British Library News Room! This was due to catching sight of the above headline – duly amended with the ?????? so as not to give an immediate clue to its content! This little snippet, and its warning about certain ‘goings on’ in our dear old High Street in 1967, advised readers of the recent appearance of a number of ‘spivs’ who had been selling their wares from a suitcase – in this instance ladies nylons! The report warned not to buy anything from them – particular as there had been a significant number of reports about the said items, which when opened, were found to only have one leg! Unfortunately a bout of the ‘giggles’ could not be held back – not just about the one leg scenario but because of also envisaging their only possible use in this condition; e.g. placing the leg over the head and going straight down the High Street to hold up Barclays – then ‘legging’ it at great speed down Selbourne Road!!! Well – I thought it was funny anyway – it just a pity that I didn’t have anyone to share my amusement with. Unfortunately, another ‘Stowie’, that I had spoken to earlier after seeing that he was researching the Walthamstow Independent, and who doubtless would of also seen the funny side, had already gone home! A full copy of the article and 4 pairs of 39 denier ‘one leggers’ is available via the Website Contact Page – DM! If you would like to receive a full emailed copy of Mr Smith’s Report, then please either leave a message on the Contact Page or call Dave on 0208 657 6327.